I’ve been a bit slack recently, but I quite enjoyed putting this mog together. I really wanted to do an ‘alternative’ wedding, but in the end, the white called to me so I went with it. 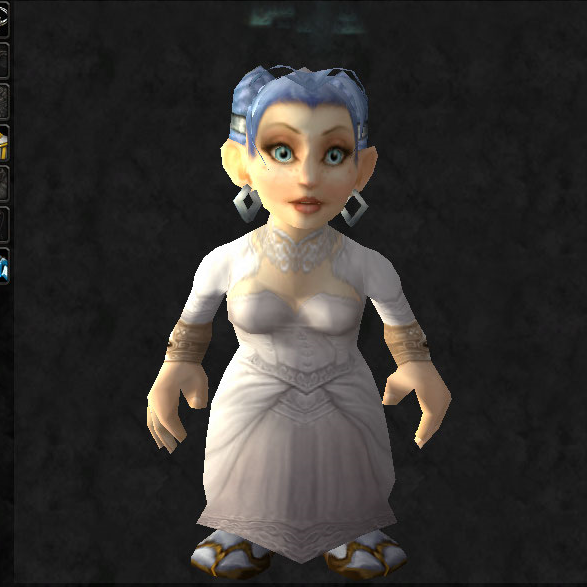 And I EVEN crafted the dress!!! It’s just a shame I couldn’t be bothered to finish it off, but at least I made that effort! Totally traditional and very simple. 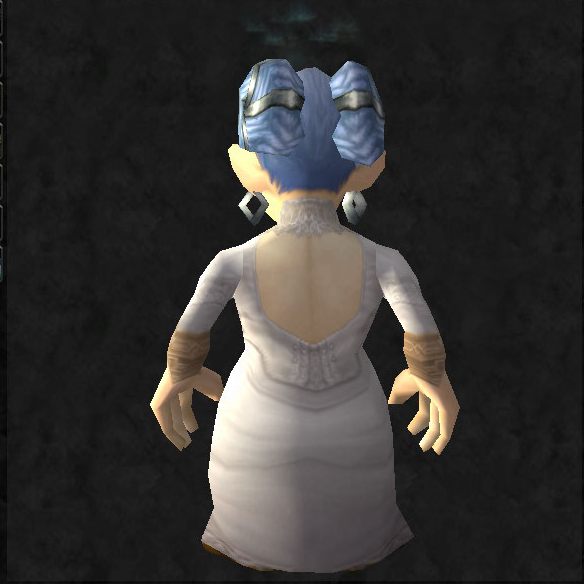 I even got an up-do for the occasion! I always feel really limited by the lack of nice shoes and visible jewelerry, but I still think she looks very pretty. Here’s the 2nd installment of our #IntPiPoMo, hosted by JoJo (@AdmiringAzeroth). We still don’t have that damn mount, he’s so pretty! My Elemental is close to my heart, always by my side faithfully fighting the bad guys. If you haven’t already seen him, you should go and visit G’nathus, who hangs out in the water on the island behind Niuzao Temple. He has 100% chance to drop the pet above too, and if you kite him with a pet, soloable! Gnomes, I couldn’t do G without featuring my lovely little Gnomie, who is very dear to me! See you Wednesday for the next installment of our travels around Azeroth! 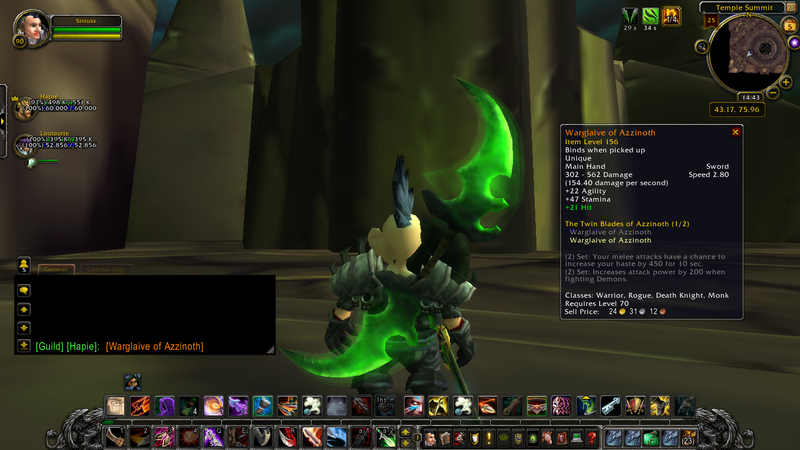 The Warglaive of Azzinoth main hand just dropped for me so HAPPY!! !Can’t wait to get the off hand now. So I kinda have an addiction to Rogues. 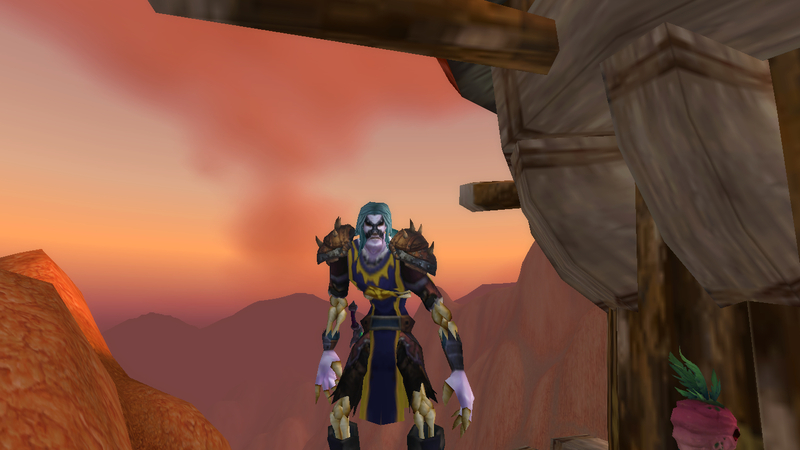 Back in Vanilla, my first 60 was my undead rogue (still have this character actually). At the start of each expansion since, I have tried to level another character and have always gone back to my rogue by the end of the expansion. In BC, I leveled a paladin at the start, then a mage and finished with my rogue. In WOTLK, I started with a warrior, then druid and ended with my rogue. 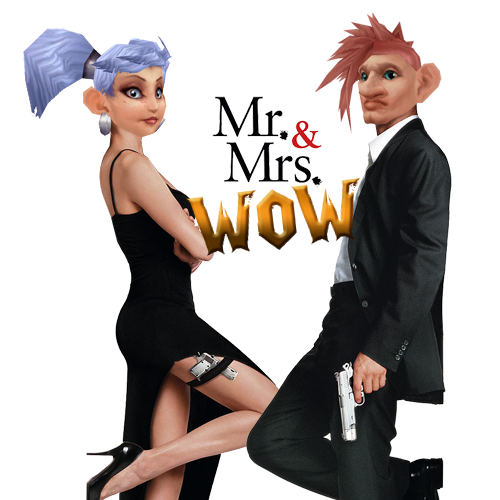 In Cata, I started with my mage, then a dk and ended with my rogue. So far in MoP, I have played my death knight, warlock, monk, priest and now my rogue as well as lots of different alts. Anyway this post is really about my first week at 90 on my rogue. I have gone from a lowly 335 ilvl when i dinged 90, to 479 ilvl in 5 days, mainly thanks to the wonderful troves of the Thunder King solo scenario. I got lucky on the way to 90 too: I got a Sha of Anger kill at 88 ish and got a Claw of Anger and the 496 tier trousers. Add to that, I already had the 476 Engineering goggles and I had pickpocketed around 20 junkboxes from which I managed to get a Krol Scimatar – the 476 agi sword. So… after I had bought the 450 rings and neck and the 458 PvP set, I was above 460 and ready to set foot into LFR. My first trip in to the LFR was excellent, I got 7 pieces of loot from the 6 bosses. I then used the rest of my bonus rolls running the first part of the LFR another 3 times, managing to get to 470 with enough time to run the first part of HoF before reset. I don’t know about you, but I don’t know many people who manage to get such a good run of luck in LFR. 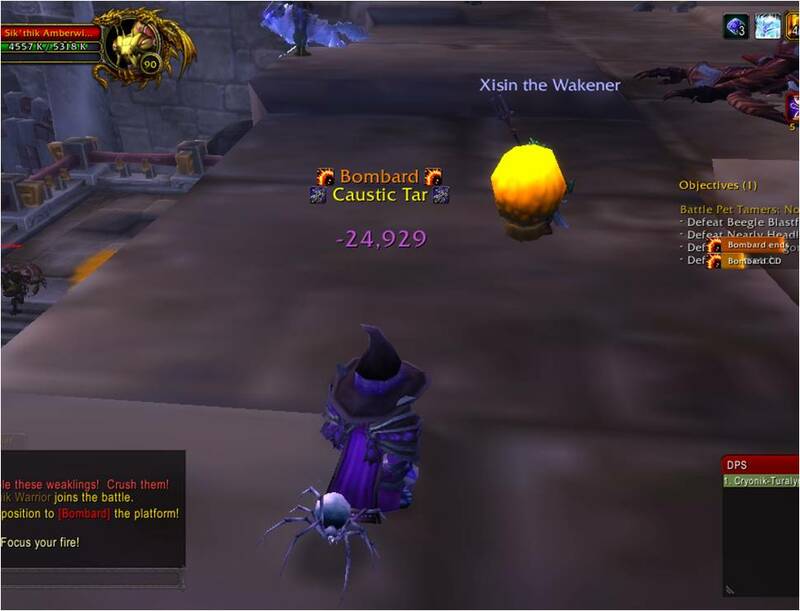 Since the reset, I have ran all the LFR’s but with no luck… only getting 1 piece of loot even with my12 bonus rolls I used. But, with that one piece and having enough valor to get the 522 next from Shado-Pan assault, I have got up to 479: 1 short of being able to access the new Throne of Thunder raid!! This coming week hopefully I will get the last 3 upgrades I need to replace the last of my blues. 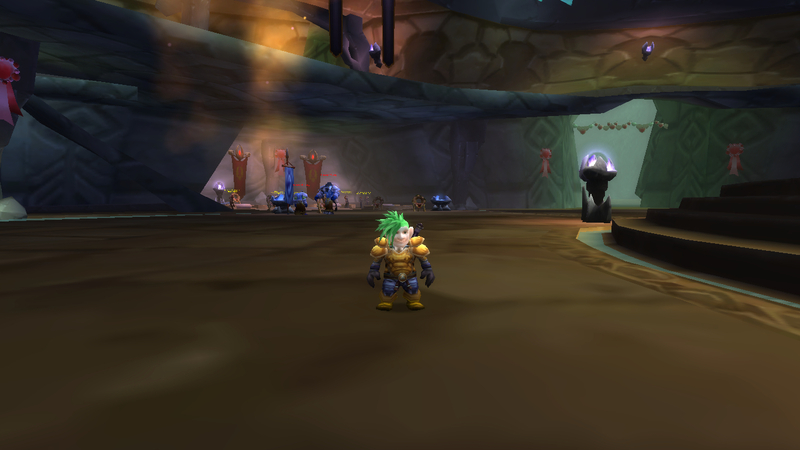 I will then be attempting the Brawlers Guild and recording and blogging about my attempts. Not a bad week, eh? 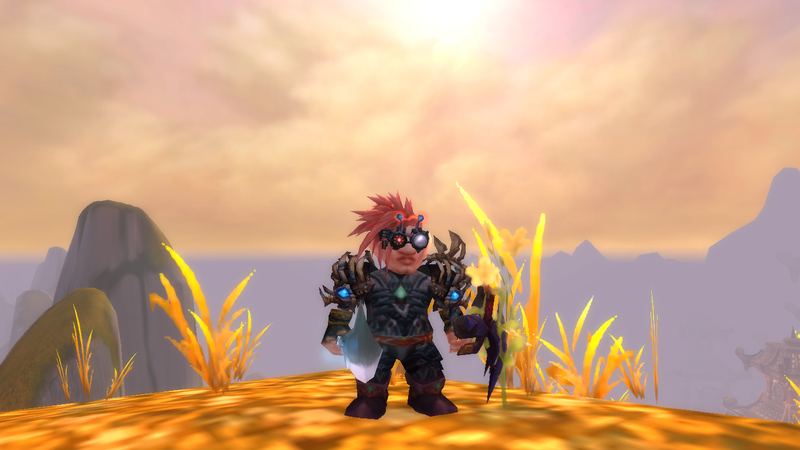 We’d love to hear your tips about the Brawlers Guild in time for my adventures. This picture was taken when we were doing the Siege of Niuzao Temple dungeon together. My incredibly mature husband decided it would be fun to see if his monk could hide behind a pot of caustic tar. So we have transfered to a new server!! Mrs B moved her mage across last week and I have moved her hunter across for her valentines day present (romantic, I know). Instead of transfering mine, I decided to level a new toon instead: I choose a monk, but rather go with a fat panda – just predictable – I went with a gnome to make a tiny little kung fu god. 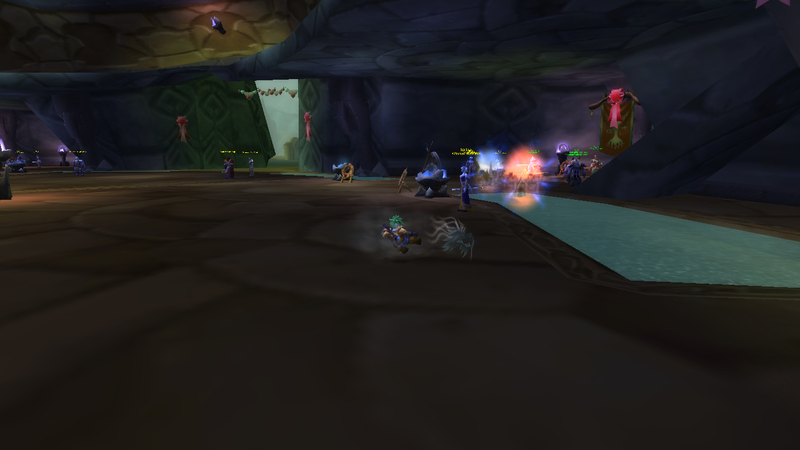 As I’m writing this I’m level 66 in the horror that is Outlands, I hate it – questing is so fragmented. I’m leveling using MrsB’s mage to boost me through dungeons every level that I am able topick up the quest in them.Still, taking a long time. I think Blizzard have done a really good job with the new animations: watching my gnome punch and kick a mob to death is a welcome change to using big weapons on them. My favourite ability so far has to be “Flying Serpent Kick”… I just love soaring though the air and landing right next to the mob! There have been a couple of hairy moments when I have kicked my way too far and almost aggro’d too many, but Mrs B and I had a lovely competiton to see who could blink furthest. I won, of course. At 90 I’m planning on doing PvP. My current working hours means it’s quite hard to find a raiding guild with times that suit me, so as much as I like PvE’ing, I just can’t commit to it at the moment.. I’m hoping to get most of the PvP achievements, I just hope I’m a little bit good. I’ll film some of it and post it on here and you can let me know what you think of my skills.